Sneak Peak At My New Bedroom! Well it’s Tuesday already and I haven’t gotten as much done as I would have liked to. But I have been feeling very domestic by getting caught up on laundry, cleaning, and cooking yummy meals for the family. But some of my decor projects have been put on hold. Decorating around my house has become a low priority since I started my little business. However I am determined to finally decorate my bedroom the way I want it! It really is starting to shape up. 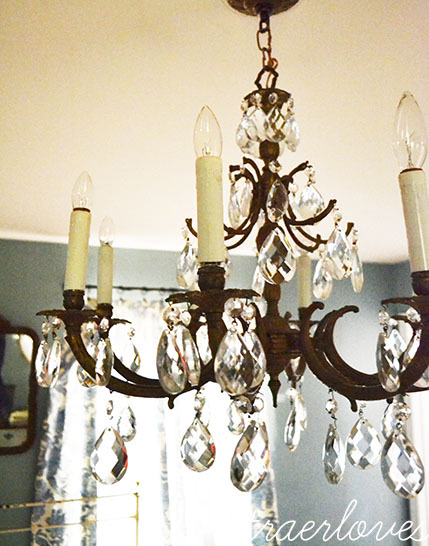 A few months ago I had my chandelier installed. This was an awesome Craig’s list purchase! The couple I bought it from were so sweet, they were both retired and were down sizing. And yesterday my fabric that I had ordered for my curtains arrived! All 12 yards of it! Making curtains is my least favorite sewing project, but I loved this fabric so much and it was on clearance! As soon as I unrolled it I had to cut it into panels and hang it from clip hooks at my window just to see how it would look! I purchased new paint for my room too. It is a warm grey and I think will compliment the other blues of my room. Well I need to get dinner prepped before my piano students arrive. I am making meatballs and blueberry muffins, yes I know so domestic of me. Take care and hopefully I will have more of my bedroom to show you soon! P.S. 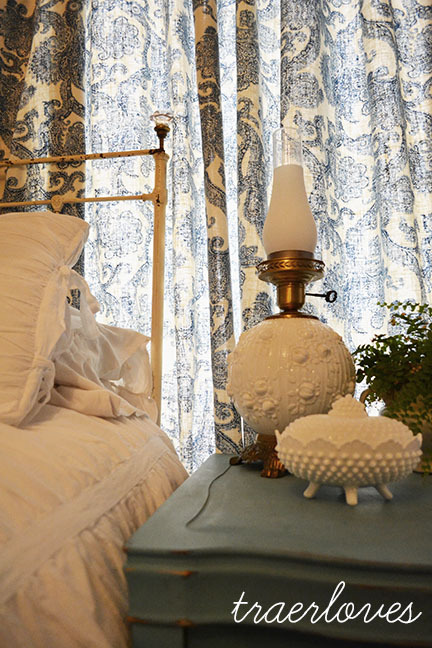 I forgot to mention that the milk glass lamp in the photo was an auction purchase. It has a matching friend, I got both of them for $1.00! Traer Lee, Please send me a little of your ambition or better yet, I’ll send you a ticket and you can come decorate my house. Love your new bedroom. I’m sure it will look great when you are finished. Hey Traer, you’ve come a long way since the first curtains you made!